Images taken on NASA's Terra satellite show volcano fissures that have oozed lava and gas in recent days on Hawaii's Big Island. The fissures are located in the East Riff Zone of the Kilauea volcano, which began erupting last week. One image shows hot spots -- fissures and new lava flow as of Sunday -- in yellow. 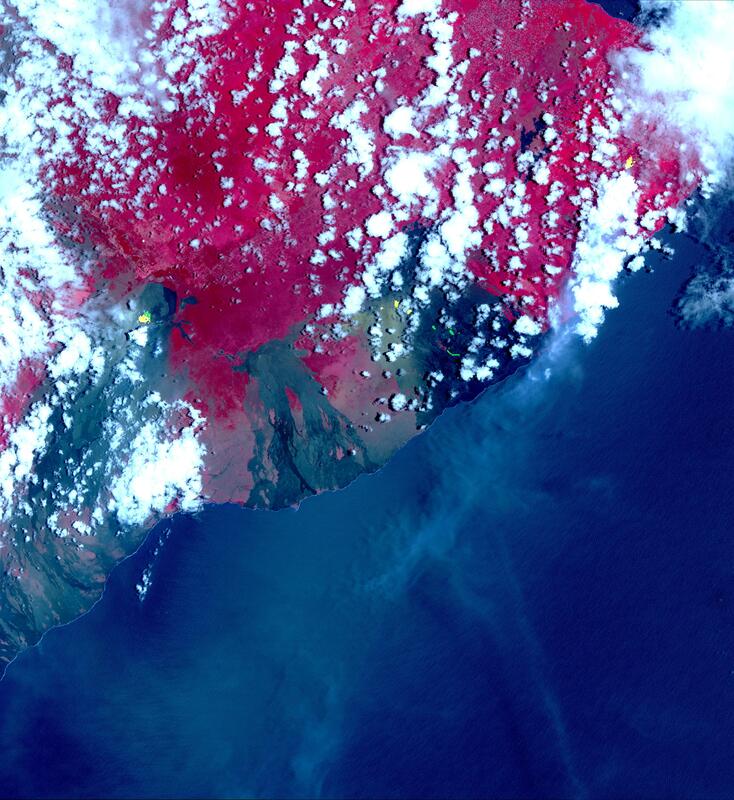 The red areas in the image, taken from the Advanced Spaceborne Thermal Emission and Reflection Radiometer (ASTER) on the Terra satellite, depict vegetation. The gray and black areas show old lava flows, according to NASA. Another image, also from Sunday, shows yellow and green streaks depicting sulfur dioxide gas, which can be dangerous at high levels. The images were taken before two new vents opened up Tuesday on Hawaii's Big Island. Those vents prompted Hawaii County to issue a cellphone alert ordering stragglers in Lanipuna Gardens to leave immediately. Authorities had previously ordered nearly 2,000 residents to leave the community and the neighboring Leilani Estates, both located in the mostly rural district of Puna on Hawaii's Big Island. But some had ignored the order and stayed to watch over their property. Edwin Montoya, 76, had planned to stay to care for animals and keep looters away from his family's property in the community. But he was forced to evacuate after the new fissures emerged, including one just a mile away. Both Leilani Estates and Lanipuna Gardens are in a forested, remote part of the Big Island on the eastern flank of Kilauea volcano, which has been erupting continuously since 1983. In recent years the volcano has mostly released lava in hard-to-reach areas inside a national park or along the coastline. But last week, vents popped open and released lava, gas and steam inside residential neighborhoods.